It’s not the first time we’ve used this beautiful print technique. 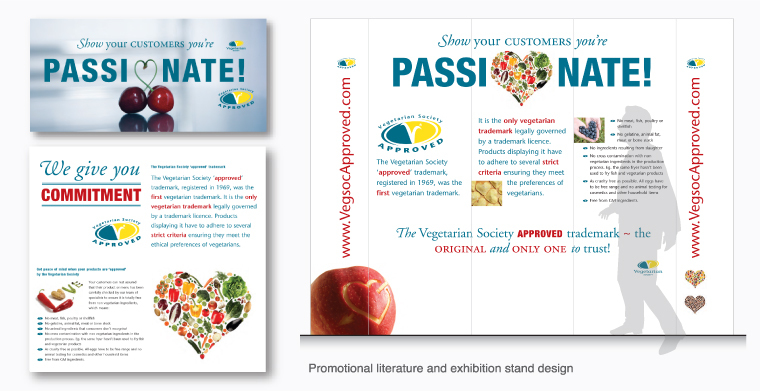 16 months ago, we designed the materials for the 2009 Vegetarian Society’s Awards event. There’s something about the tactile, hand-crafted feel of letterpress which makes it so engaging – and the design of the event materials was complemented with sensual typography, high quality papers and cotton stitching, creating a very bespoke suite of literature. These materials were designed for The Ideas Facility, who sponsored this event. Vanessa Brown, Head of Corporate Relations. If there’s one thing that Tilley and Associates share with The Vegetetarian Society, it’s a passion for what we do. This concept formed the basis for the creative approach and was also used as the theme for the awards event materials, mentioned above. This campaign used visual metaphor to re-inforce the fact that the ‘approved’ mark is the original and only ‘suitable for vegetarians’ endorsement. ‘Unusually’ coloured fruits and vegetables were used on-line and across a suite of promotional literature to communicate this message. This entry was written by Eric Tilley, posted on January 19, 2011 at 3:32 pm, filed under Work and tagged awareness, campaign, design. Bookmark the permalink. Follow any comments here with the RSS feed for this post. Comments are closed, but you can leave a trackback: Trackback URL.